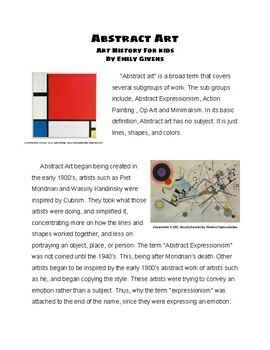 This is an article I wrote about Abstract Art. The article includes Abstract Expressionism, Action Painting, Op Art, and Minimalism. I have a degree in art, and have fact checked all my information. The reading comprehension level I would assume to be 4th grade and up. Includes pictures.